The third solar vehicle that arrived was Punch Two of Punch Powertrain Solar Team from Belgium. 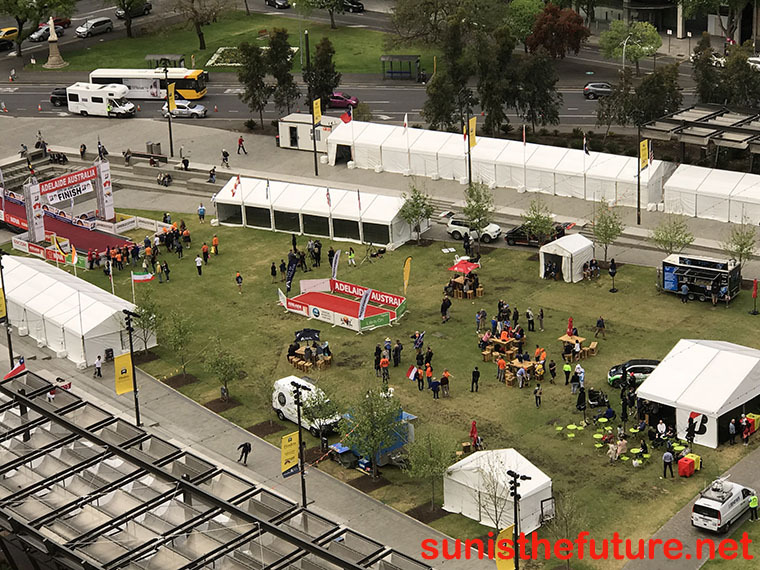 More photos, videos, and posts about these and other solar vehicles designed, built, and raced by students from 30 countries will be presented in the following posts. Elon Musk has followed through with his promise to solve the growing energy crisis in South Australia in 100 days! 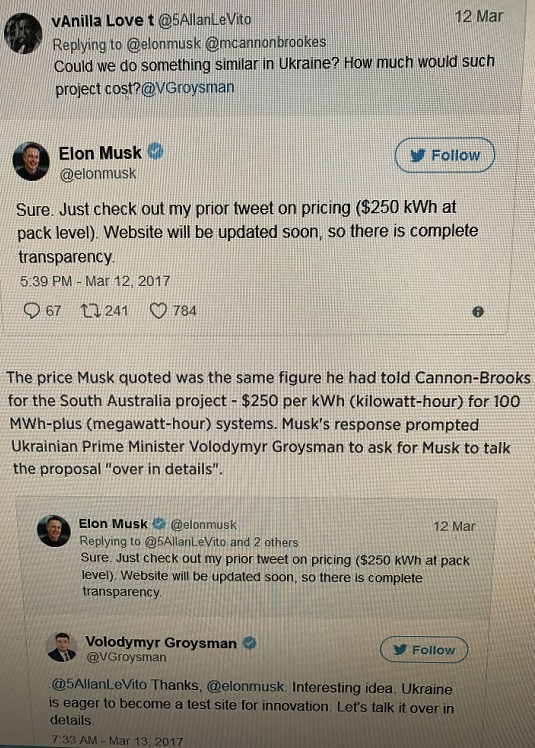 Tesla (TSLA) cofounder and energy division head Lyndon Rive boldly claimed, back in March of 2017, that he would commit to installing the 100-300 megawatt hours of battery required to prevent the increasingly frequent blackouts of South Australia within 100 days. He said the company could do the same in Victoria, where the closure of the 1600 MW Hazelwood coal plant in March was raising more fears of increasing blackouts across the eastern states electricity market next summer, following a near blackout in NSW on February 10 after an unexpected spike in demand due to a heat wave. Musk upped the ante by not only backing Rive’s claim but also insisting that if the 100 MWh of battery system would not be installed within 100-day window, he (Musk) would offer the service completely free of charge. 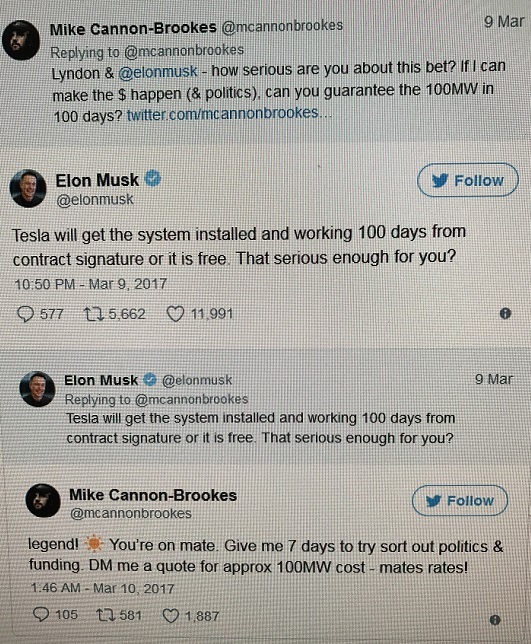 When the billionaire-entrepreneur Mike Cannon-Brookes asked Musk in March, if Tesla was serious when it claimed it could quickly end blackouts in South Australia,”Tesla will get the system installed and working 100 days from contract signature or it is free. That serious enough for you?” Musk tweeted at the time. 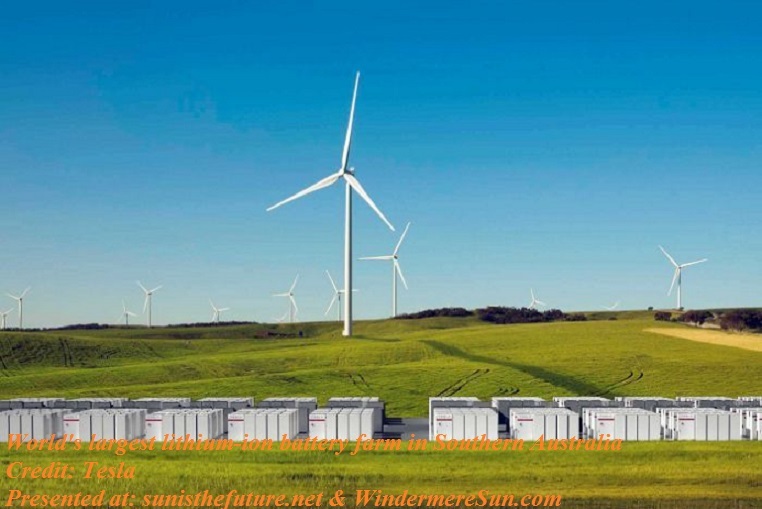 To solve South Australia’s energy crisis, Tesla (TSLA) has teamed up with French renewable energy firm Neoen and an Australian state government (with a South Australian company CPP doing the ground work) to install the world’s largest lithium ion battery farm. Paired up with Neoen’s existing Hornsdale Wind Farm in the state of South Australia, near Jamestown, north of Adelaide, the battery farm will have three times the capacity as the next biggest in the world. 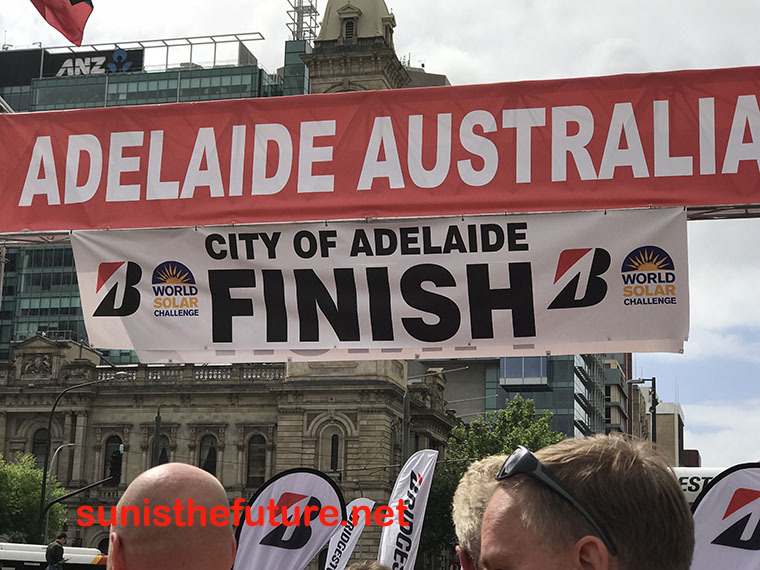 South Australia Premier Jay Weatherill said this extraordinary collaboration would deliver a grid-scale battery that would “stabilize the South Australian network as well as putting downward pressure on prices. Battery storage is the future of our national energy market, and the eyes of the world will be following our leadership in this space.” The project is intended to sustain 100 MW of power and store 129 MWh, being able to power about 30,000 homes, according to Tesla. The project is currently slated for completion by December to harness the existing Hornsdale Wind Farm to charge the mega-battery while the wind is blowing and discharge power when it is most needed. Musk commented, “It’s a fundamental efficiency improvement to the power grid, and it’s really quite necessary and quite obvious considering a renewable energy future.” In essence, by storing renewable (wind and solar) energy during off-peak hours and then discharging that energy during peak hours, utility companies are able to cut costs, improve reliability and resiliancy, and reduce reliance on non-renewable energy sources. Tesla was able to beat the other 91 international bidders for this project. It is understandable, for the company has made substantial progress in the utility front since introducing Powerwall and Powerpack about two years ago. 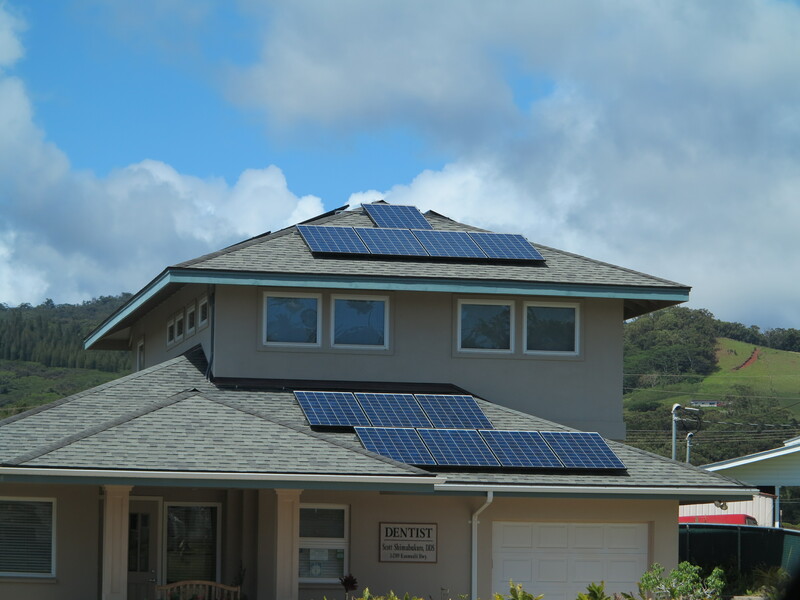 Tesla now supplies energy to the Hawaiian Island of Kauai using a large solar energy plant running on the Powerpack technology. Medium size businesses are also turning to Tesla tech for energy storage, including the Sierra Nevada Brewing Co., Southern California Edison’s Mira Loma substation in Ontario, California powering 15,000 homes. So, while the South Australia project may have an ambitious timetable, Tesla’s impressive resume suggests that the 100-day goal should not be a problem for Tesla. In the meantime, rumor has it that citizens from other countries have also taken to social media to ask Musk for help. A user by the same of @5AllanLeVito asked Musk to bring a similar project to Ukraine, above. Musk’s response “Sure”, and laid out the cost. New Zealand and others may soon to follow. Thank goodness for new technology Twitter: much will be accomplished within much shorter period of time! Hurray for the renewable future! Hurray for America’s adopted son, Elon Musk, in his progress/effort in saving our planet earth! Perhaps the Floridians should start tweeting Elon Musk for our battery system! Need Funding? Stage Is Set For Renewable and Solar Energy Projects! The stage is set. The time is ripe. With the cost of both solar and wind having dropped tremendously in the past three years, solar technology having enabled greater efficiency, the incoming Tesla’s Powerwall, Powerpack solving the storage problem, and Tesla’s integrated and cost effective solar roof… the inevitable Solar-Renewable Tsunami is knocking on our door. Astute green investors and lenders could all hear the knock and are ready to finance solar energy projects and fund power developments of renewable-sustainable energy resources. In the U.S., a mix of federal production tax credits and individual state renewable portfolio standards (RPS) are definitely pushing the market. To better understand various policies and incentives for renewables and efficiency by states, please click HERE. For example, state of CA has 187 such policies and incentives whereas state of FL has 77. Of course the incentives of some of the E.U. nations are also fueling the market. But most importantly, it is the simple fact that the cost of solar have dropped so much that it is now a more secure investment than putting one’s money in the bank (bank has a rate of return of about 0.8%-1.1% without inflation protection whereas investing in solar provides a rate of return ranging from about 3% (in AK without any tax credit or incentive, it is 4.4% with tax credit and incentives) to 24.4% (in HI with tax credit and incentives, location-climate-incentive dependent, and this is with inflation protection). Therefore, 1/Payback Time = 1/7.62 =0.13 1 or 13.1% = Rate of Return on Solar Investment, keep in mind that this is with inflation protection (utility bills are always going up). At this point, I’d like to share with you all a site that had already done the work for you, state by state, Solar Power Rocks., in figuring out the Investment Return (IRR), with consideration of respective state’s tax credits and incentives. As a result, there are much opportunities for high yielding rates of return on investment in solar as well as other green renewable sources. In the coming decades, there will be so much transformational developments waiting to be planned out and completed. 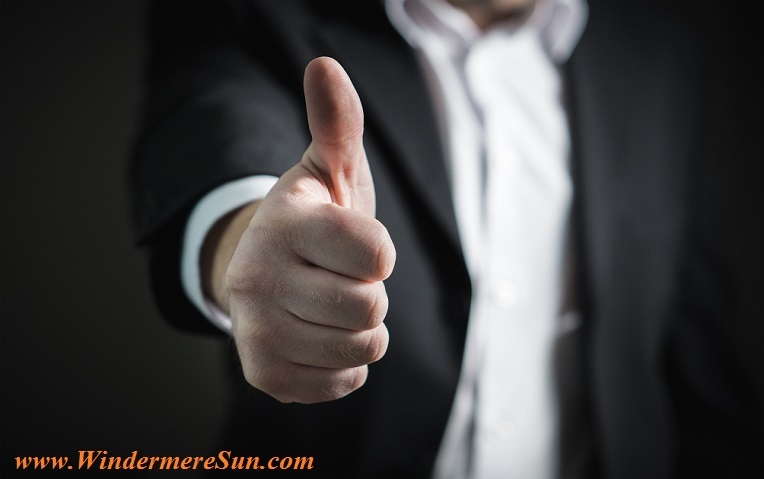 If you have a project ($multi-million project) in mind, with a plan but insufficient funding, please contact me via: info.WindermereSun@gmail.com so Windermere Sun may be able to introduce you and your plan/project to potential investors/lenders. 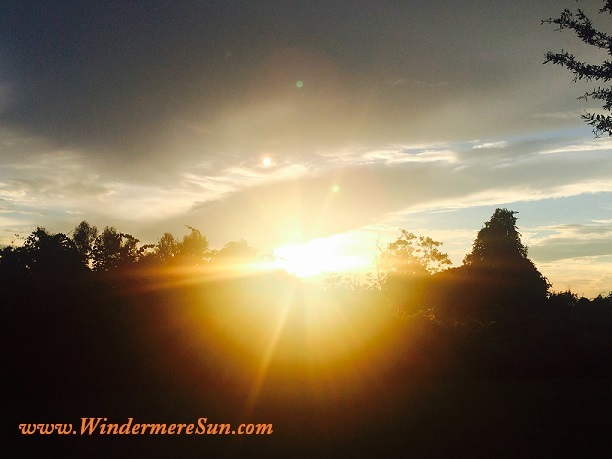 If you are an angel investor, potential investor or lender for solar projects, please feel free to contact me at: info.WindermereSun@gmail.com so we can spread the sunshine globally while saving our planet earth! Investment Criteria for Joint Venture Financing: financing for all types of commercial real estate and alternative energy projects. In general, they must meet the following criteria: • The project 5% down or more; • The project must be shovel-ready–defined as ready to break ground in 90 days or less; • The project must be sponsored by an experienced developer with a significant financial stake. • Asset-based loans, including In-Ground Assets; • Corporate expansion loans; • International Funding; and • Hard money loans. Joint Venture Financing Project Types: (NEW DEVELOPMENT ONLY) • Hotel Resorts and Casinos • Assisted Living/Senior Housing • Apartment Buildings/Multifamily Housing • Alternative/Renewable Energy (i.e., solar, wind, hydro, geothermal, etc.) • Green Energy (i.e., biofuel/biodiesel, biomass, waste-to-energy, etc.) • Hospitals and Health Care Facilities • Infrastructure (roads, highways, rail, etc.) • College and University Buildings • Public-Use and Recreational Facilities • Industrial Projects • Other Related Types Locations: USA and International, Joint Venture Financing Terms: • 95% equity financing • Typically three to five year term • Non-recourse financing • No interest payments during term of investment • Minority equity stake in lieu of interest • Take out with permanent financing or sale Time to Closing: 90 to 120 days. May we all have many many bright and sunny days. 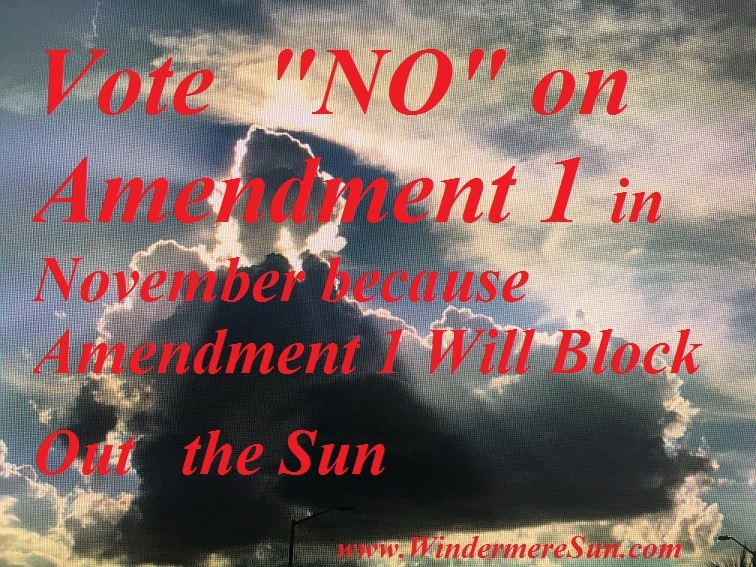 Vote “NO” on Amendment 1 in November Because Amendment 1 Will Block Out the Sun, Floridians !!! Amendment 1 part (a) promises the right Floridians already possess (the right to own or lease solar equipments on their property) but prevents Floridians from selling any excess solar energy produced to be sold to others outside of the property owner. 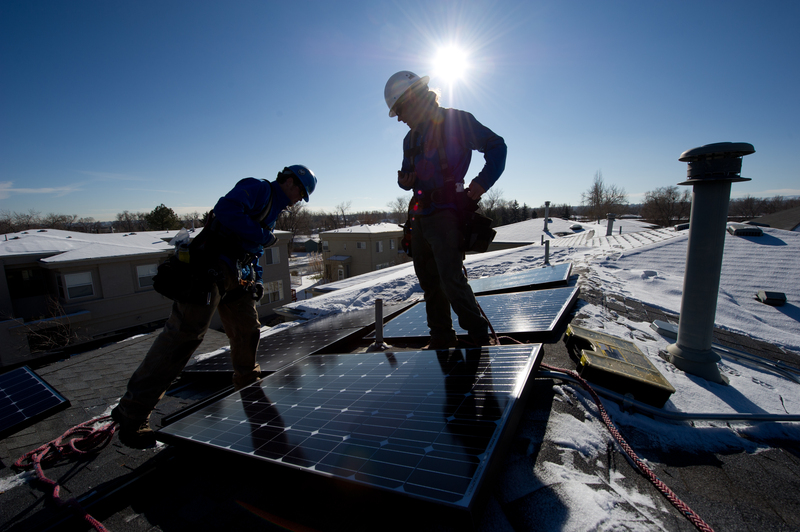 Amendment 1 part (b) may potentially allow utilities to create another fee to be charged to solar installation owners or solar power users even if these solar power users are not customers of the utilities. So a votes of “yes” on Amendment 1 would: a. establish constitutional right rather than keep it statutory. b. eliminate free market potential for electricity c. create assumption that solar power users are subsidized by utility customers. 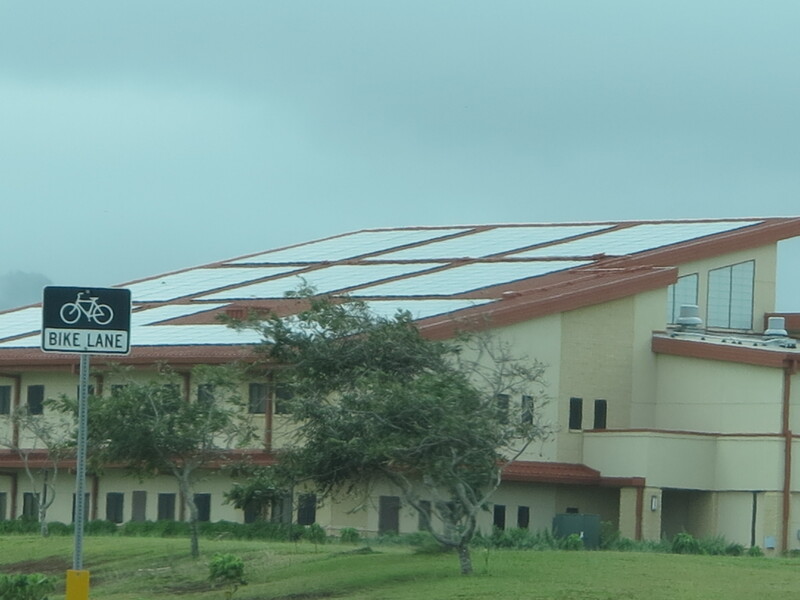 Passing Amendment 1 would potentially destroy the solar businesses in Florida (as a similar measure did in Nevada). Especially after the recent visit from Hurricane Matthew, it is critical for us to promote both utility scale and distributed solar throughout our state and our U.S.A.! This is not only for the fact that Florida needs to live up to its name sake, The Sunshine State, but the fact that much of our state revenues depend on tourism, and therefore our air and water quality plays an important part of our state’s income. Furthermore, the climate change or warming of our planet earth would speed up the process of our disappearing coastal cities (esp. Miami). This is another reason why Florida should make strong effort in supporting solar energy to flourish, to slow down the climate change and warming of our planet. Don’t forget the fact that solar energy is the source of energy that cannot be exclusively possessed by few nations on earth. Therefore widespread use of solar energy would prevent potential warfare among nations for the sake of fuel. Finally, it is undeniable that we are progressing toward the Clean/Renewable Energy Future, whether the politicians like it or not. The sooner our politicians accept this fact and learn to adapt to the Clean/Renewable Energy Age, the better off we all will be, in terms of state economy, business, individual standard of living, and our beautiful environment of state of Florida . Therefore, it is particularly frustrating that my and your dollars spent on our utility bills are being spent on promotion for something that will potentially destroy the solar industry in Florida, the Amendment 1! So, please bear with me for continuing to post about Amendment 1, reminding Floridians to VOTE NO ON AMENDMENT 1 IN NOVEMBER !!! 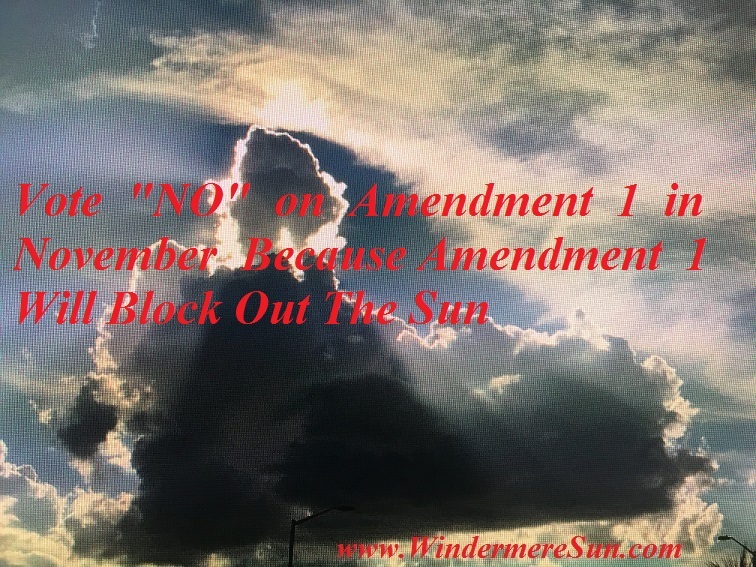 I may not have multi-million dollar advertising budget, but I do have Windermere Sun….so, let’s help our beloved Florida to be worthy of its name sake by spreading this message of need to Vote “NO” on Amendment 1 in November ! We don’t want the solar growth and solar industry to be destroyed as it did in Nevada by a similar measure in Amendment 1.
and share this post and Windermere Sun with others! Hurray! Sunisthefuture Team at Kiva ranked 4th place today, after: Hewlett Packard Enterprise, The Mindful Bunch, and Carnegie Mellon University teams! Thank you, team members, for a job well done! With Amendment 4 being passed in Florida and Sunisthefuture Team at Kiva placing in top ten teams at Kiva, it is a Fantastic Week for Solar future! We want to spread more sunshine throughout the planet earth by increasing opportunities that would make this planet earth a better place to live. This is accomplished via micro-finance. With as little as $25, any one is able to participate in helping another entrepreneur on planet Earth via the platform of Kiva. We are hopeful and optimistic that sun, water, wind, and geothermal energy will lead us into a world free from pollution and war. Let us earthlings look for ways to make this a reality! 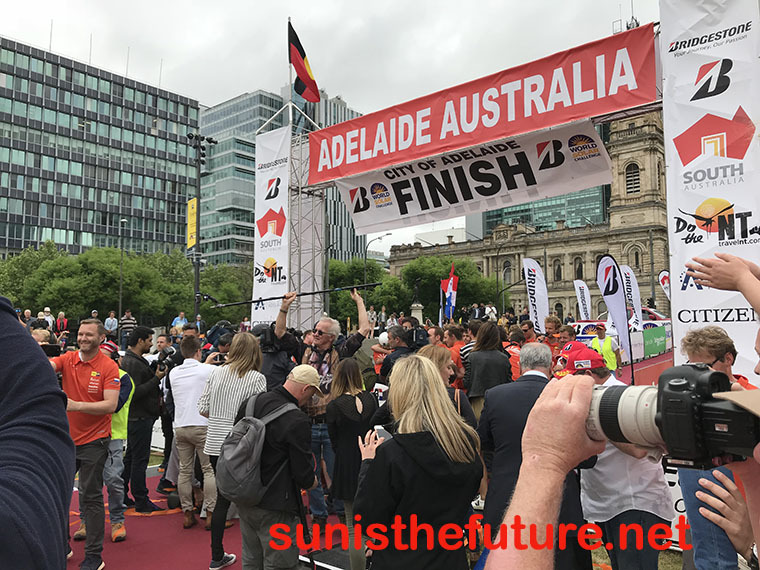 Sunisthefuture Team supports entrepreneurs from USA and various developing nations in starting/maintaining businesses in solar energy/renewable energy/recycling/energy efficiency. Click on “Loans” and “Members” at Sunisthefuture Team at Kiva web site to see which small businesses we’ve supported and who are members on Sunisthefuture Team at Kiva. 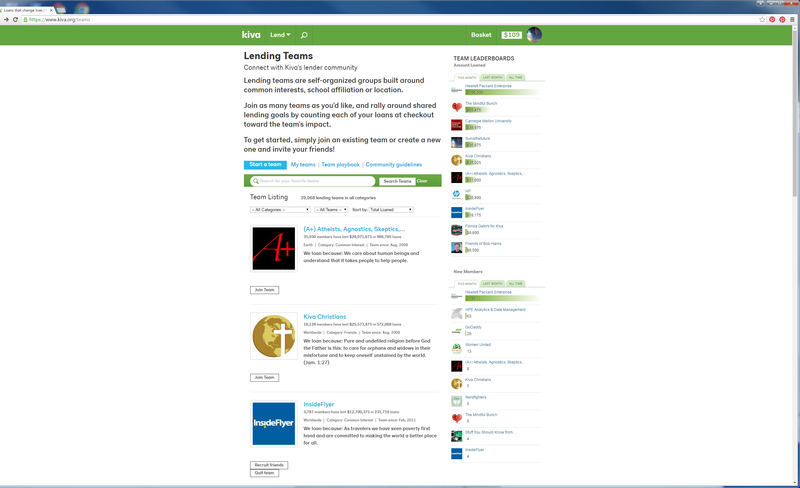 To see what Green Loans are currently needing help to be funded, click on “Lend” on top of the page, then select (placing a check mark inside the box next to…) for “Green” under ATTRIBUTES in the left hand margin. At the end of the transaction, be sure to click on “complete order” in order to complete the transaction. 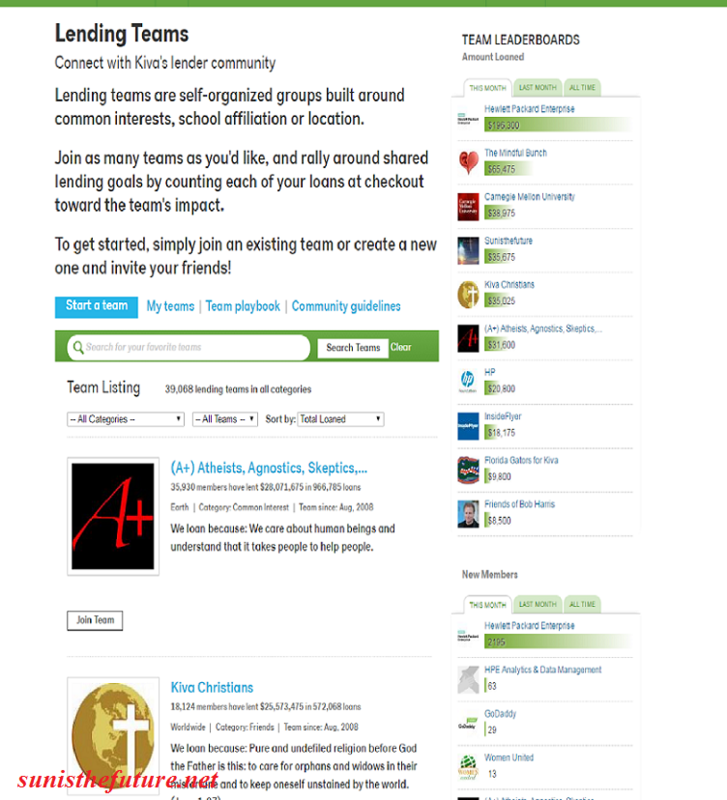 Then check to see if the number of loans has been correctly added for your individual profile and for the team you’ve attributed the loan to. Dear Fellow Floridians, for more information about Early Voting, please refer to our Previous Post . If you have any questions about voting, please call the Election Protection hotline at: 1-866-OUR-VOTE (1-866-687-8683) or 1-888-VE-Y-VOTA (1-888-839-8682-Espanol.) Assistance is available in English or Spanish. We, the Floridians, have been blessed with generous sunshine, residing in the SunShine State. 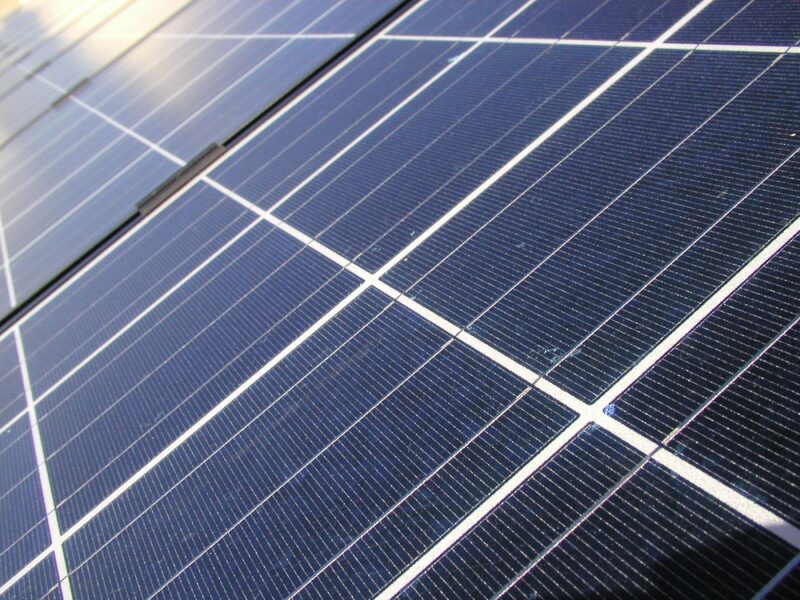 In the August Primary, Floridian voters will have the opportunity to lower energy cost and boost future solar energy production in the Sunshine State by voting YES for Amendment 4 on the Primary Ballot. Amendment 4 will amend Florida’s Constitution to exempt the value of solar panels and other renewable energy equipment from both the tangible personal property tax and the real property tax. In order for Amendment 4 to become law, it must be approved by YES vote from at least 60% of the Floridian voters for the August 30 Primary Ballot. Solar Devices or Renewable Energy Source Devices;Exemption from Certain Taxation and Assessment. Proposing an amendment to the State Constitution to authorize the Legislature, by general law, to exempt from ad valorem taxation the assessed value of solar or renewable energy source devices subject to tangible personal property tax, and to authorize the Legislature, by general law, to prohibit consideration of such devices in assessing the value of real property for ad valorem taxation purposes. This amendment takes effect January 1, 2018, and expires on December 31, 2037. Firstly, ad valorem simply means in proportion to the value. So, Amendment 4 is proposing to remove the tax based on the value of the solar panels/renewable energy source devices and also to prevent the inclusion of these devices when assessing the value of the real property. 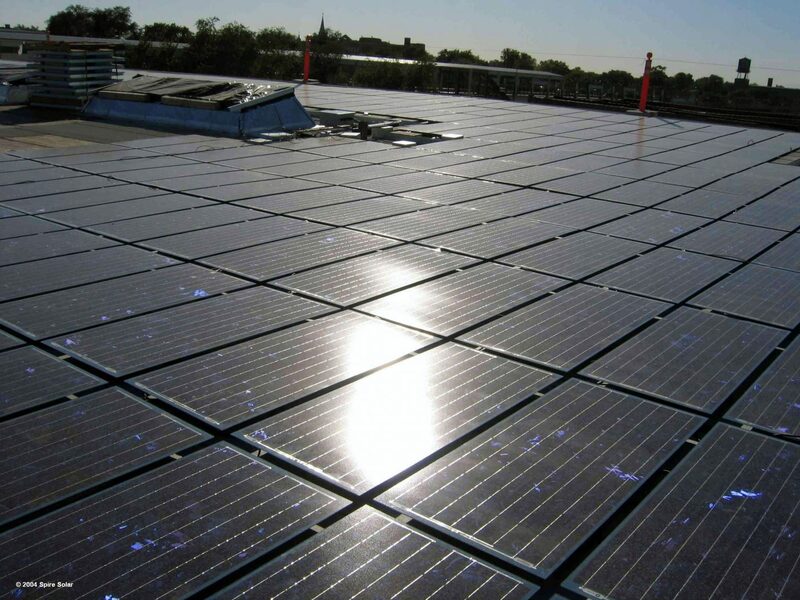 This amendment, if passed, will enable solar energy in Florida to be much more affordable for every one (commercial, as well as residential), help to increase the number of solar jobs and further solar development in Florida tremendously , and at no cost to Florida’s taxpayers because these taxes are not being collected now. and increasing suicide rate of farmers from different parts of the world (India, Australia, etc.) resulting from extreme weather conditions due to increased rate of climate change…. It is our moral imperative to do everything possible in slowing down the current rate of climate change. It is also our sense of practicality that should direct us quickly toward transition into solar and renewable energy. The great irony in life is that: those of us in the developed nations have been contributing far more than those in developing nations to this dramatic increased rate of climate change. But when the chips are down, it is those in the developing nations and the poorest who will be suffering more. There is something terribly wrong with this picture. It would have been far more impactful if Amendment 4 were passed more than a decade ago. Voting YES for Amendment 4 now is the least that we can and should do. In addition to installing solar, I believe we should also be thinking of switching to electrical vehicles, recycle more, bike and walk more, eat less meat, etc. 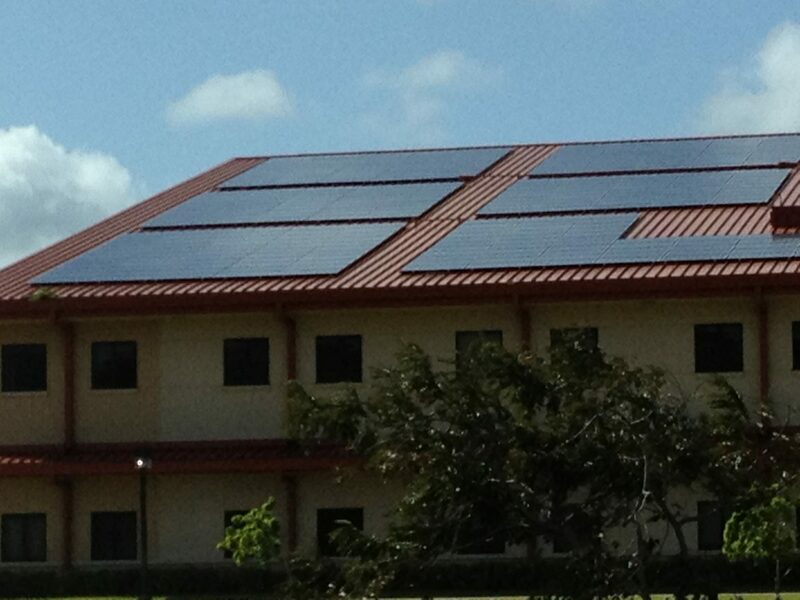 It is economical/practical and ethical to encourage the growth of solar and renewable energy in the Sunshine State! Early Voting between August 15-August 28 or August 20-August 27 or……., depending on which county you are in. By mail starting from July 26, 2016 and be sure your mail-in ballot is received by 7:00 pm on election day, August 30, 2016. So, those of you who are planning on mailing in your ballot, be sure you do so ASAP. For those of you interested in clean energy future, you may like to know that Florida Solar Voter is a project of the Southern Alliance for Clean Energy dedicated to providing all Florida voters an easy way to sign up to vote by mail. Please feel free to contact Southern Alliance For Clean Energy via 813-252-1751 or www.CleanEnergy.org .You may also be interested in visiting Floridians For Solar Choice. Elon Musk Opens The Tesla Gigafactory! Time to pop the cork from the champaign bottle! I can’t wait to share this video with you! Elon has done it again! Wow, truly, we are at the final frontier! Facebook has just announced the first successful test flight of a high-altitude solar plane to bring internet access to remote parts of the world (where 1.6 billion people reside) currently without mobile broadband network. Back in March of 2015, Mark Zuckerberg revealed that Facebook had been testing drones in the skies over UK. The Aquila drone has the wingspan of an airliner, weighs about a third as much as a car, and consumes only 5,000 watts (equivalent to 3 hairdryers or a powerful microwave ) when cruising. It was developed in Bridgwater, Somerset, by Ascenta, a designer of solar powered drones that Facebook bought in March of 2014. Facebook plans on having Aquila as a fleet of solar powered aircraft that will provide internet to people in sub-Saharan Africa and other remote regions currently without online access. Once they are fully operational, these high altitude planes will stay airborne for up to 90 days at a time and beam broadband coverage to a 60-mile wide area on the ground, availing internet to people in under-connected regions. After months of flying scale models, the Facebook Connectivity Lab finally completed first full-scale test flight and provided much data on Aquila’s performance on autopilot, batteries, motors, radio, displays, ground station, aerodynamic handling, structural viability, and crew training. The low altitude test flight lasted for 96 minutes (more than three times the originally planned mission length). During the winter, solar panels need to collect sufficient energy during short days to keep the batteries charged over long nights (up to 14 hours at a time). Overall need to reduce the cost in order to insure that the project would be viable.